Our entryway is a bit of a non-event. It opens to a long, dark hallway, and it’s the go-to place for dumping shoes, jackets, bags and bike gear, so it has never been my favorite space. When we first moved in, I hung a little shelf and a row of hooks, but the hooks didn’t hold all our stuff very well, and I knew we could make it more efficient. When my Dad was visiting, he helped me (or rather, I helped him) give it a face lift. 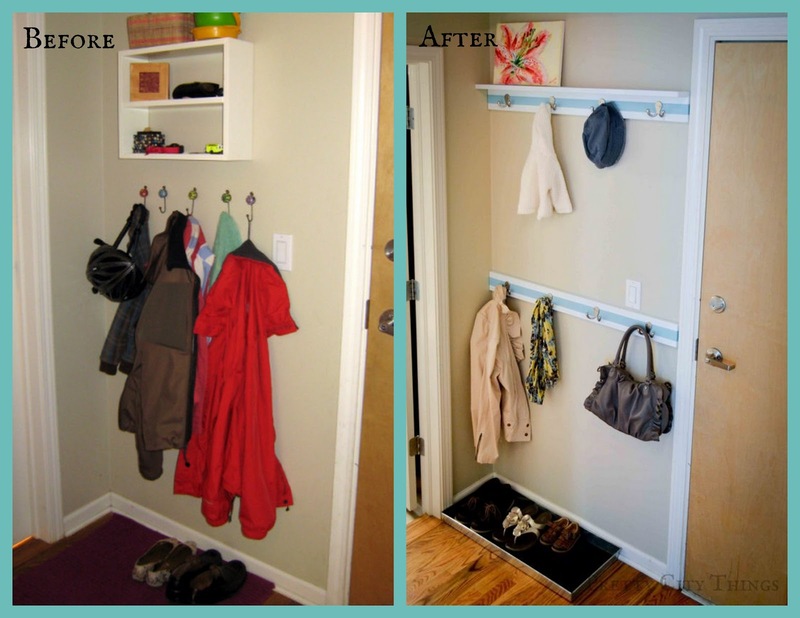 We custom built two rows of coat hooks (sixteen hooks total, versus the original five) and a little shelf, so it’s much more efficient now, which means it’s also tidier and prettier. We chose plain nickle hooks to echo the door lock and handles (much as I’d have loved a mix of Anthropologie beauties, they just wouldn’t have worked in our space). I painted the wood using paint left over from the big boy room and our fireplace. My Dad thought I should have left the wood white, and I suppose it would look more built-in if it matched the door trim, but I still like it as-is. When we were done, we had a much more efficient and organized space. I also added a boot tray to coral what would otherwise be a big pile of shoes, and the ledge is now home to an oil painting. Wow, such a great project, and what a transformation, it really makes the space! I'm glad you found a close place to move – hope it works well. What a cute idea for organization. I love the hooks, too! I guess the new owners can now benefit from your amazing organizational idea and project! 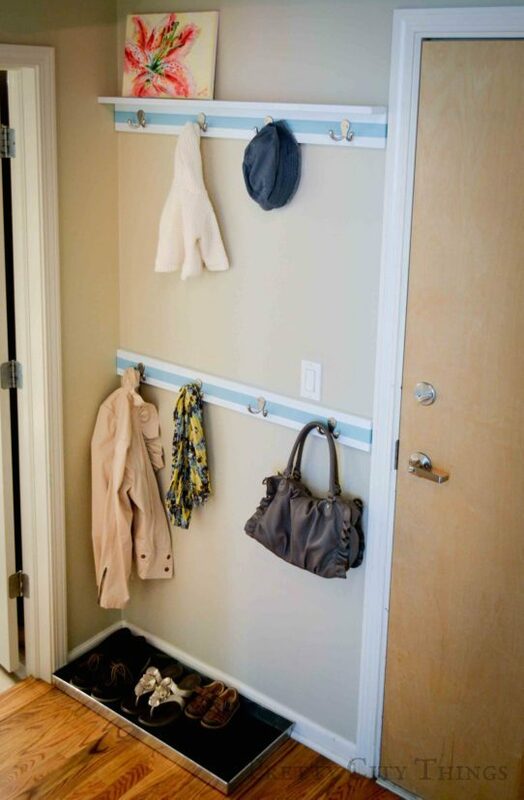 you can never have too many coat racks! How nice to have those hooks right there. Thanks for sharing.